Steal this graphic if your're in! 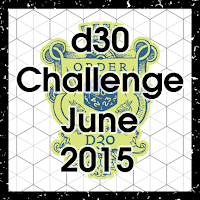 Mark, over at Creative Mountain Games, mentioned taking the "Dungeons & Dragons 30 Day Challenge". Well....he actually mentioned seeing some people taking it and was considering it. I'm not sure how much he really is considering it, but this was the 1st time I've heard of such a challenge and the thought intrigued me. Partially because I'ma sucker for these kinds of thing, but also because I was just thinking on how I don't give nearly enough love to my d30's, which I barely got last year at the Origins Game Fair. Evidently somebody associated with some "live dungeon" tried to buy out every d30 Lou Zocchi had. Fortunately they missed two which are now mine! I'm going to that con next week and this week I've been prepping some since I'm trying to travel a bit lighter than usual. I have a much smaller dice box to work with, and Sunday I did check to make sure there was room for both my d30s. 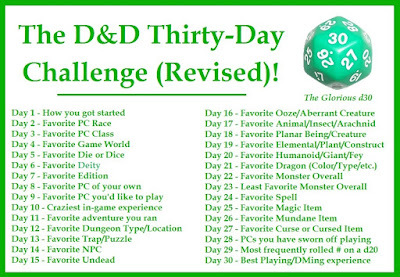 Anyway, I thought it'd be a good idea to answer these 30 questions (I'm using Mark's modified list) over the 30 days of June and cough up a special d30 table to give away at the conclusion. Heck I figured it I could convince a few people to try this out I'd even be willing to assemble the tables into a nice booklet/book form. Does that sound like a plan? 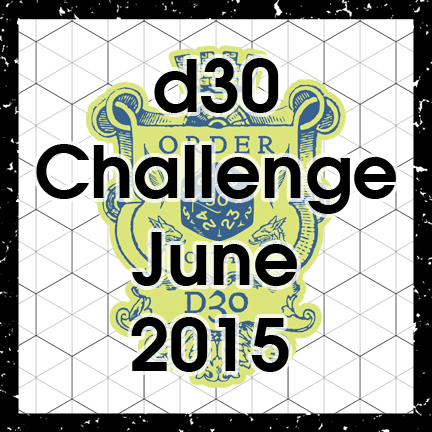 Have something worth posting every day in June, getting to know some folks in the community, and have another (free) d30 product to show for it? 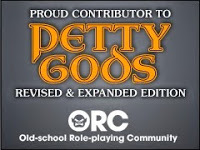 Feel free to take part and put the peer-pressure on Mark, unless he's going to Origins because I don't want him chasing me down.